On December 4, 2017, the Supreme Court lifted an injunction on the third travel ban, allowing it to proceed. The Court did not articulate their reasoning for this decision. This does not mean SCOTUS has found the travel ban to be lawful or unlawful, it is merely waiting for the lower courts to issue a ruling. In fact, SCOTUS has asked the 9th and 4th Circuits to issue their decisions quickly due to the potential impact lifting the injunction can have. However, to some, it informs how the Court might rule in the future. The Department of State responded by issuing updated guidance on who is impacted and how. It explains that certain hopeful immigrants and non-immigrants from Chad, Iran, Libya, Syria, Yemen, and Somalia, in addition to the already banned categories of people from Venezuela and North Korea, will now be unable to obtain a visa. Those with an already granted visa will not have their visa revoked, and those with an already scheduled interview will not have their interview cancelled, though they can still be denied the visa itself. The decision does not impact Legal Permanent Residents or dual citizens from a country not listed. Those with a close relationship, understood to be: immediate relatives of U.S. citizens, legal permanent residents, and lawfully admitted non-immigrants with pre-existing visas, are generally exempt from the travel ban or eligible for a waiver as well. Additionally, the consular officer can decide on a case-by-case basis to waive the travel ban and grant the visa. As of yet, no clear guideline has been released on what the waiver requirements are. There is no application process for the waiver, the consular officer will determine if one qualifies for a waiver based on the vague guidelines: that issuance is in the national interest, the applicant poses no national security or public safety threat to the United States, and denial of the visa would cause undue hardship. Immigrant and Diversity Visa lottery winners from each of these six countries and North Korea will no longer be eligible for a visa. In addition, B1/B2 visas for Chad, Lybia, and Yemen will no longer be issued, and no non-immigrant visas will be issued for North Korea or Syria. No non-immigrant visas for Iran will be issued, except for F, M, and J visas. Certain government officials and their families from Venezuela continue to be banned. Both the 9th and 4th Circuits have heard the oral arguments. We now wait for a decision and appeal by the losing side to the Supreme Court. In the interm, many will be impacted by this travel ban. 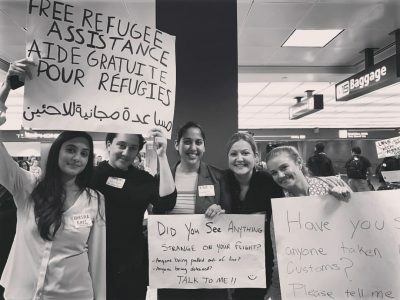 We encourage those impacted to contact organizations such as Dulles Justice (legalhelp@dullesjustice.org).